Powers/Abilities: "The Touch", which can heal a person just by touching the individual. He can heal himself as well, even to the point of regrowing limbs. On one occasion--possibly backed by the power of Belasco--he resurrected someone who had apparently died within a few hours time. Smith is also highly charismatic, able to influence others and develop a cult following. His cult, the Church of the Saved, includes many former soldiers, who are skilled at various forms of armed and unarmed combat. They have access to various ballistic weapons, including missile launchers. History: Sammy's origin is unknown. (Punisher II#4 (fb) - BTS) - In Terra Haute, Indiana, Sammy Smith made a name for himself as both a faith healer and as a revolutionary blend of socialism and religious fervor. He made no secret of the fact that he was actually an atheist, but managed to gather a large cult-following nonetheless. (Punisher II#4 (fb) - BTS) - After setting up the Church of the Saved in Bedford Stuyvesant, Sammy began to recruit inner-city African Americans and other minorities, as well as disenchanted white people. After stirring up their fervor by describing the USA as racist and fascist, he began to make plans to relocate the Church to Dutch Guiana. (Punisher II#4) - After his former weapons supplier, Martin, was killed, the Punisher followed a lead to the Church of the Saved, about whom he learned from Ray White, whose wife had left him for the Church. Taking the name of a dead marine from his former troop, Joe Rainey, Castle infiltrated and won the trust of the Church with the aid of White. Castle was brought before the Rev, who sent him--along with Church members Byron Gresham and Keena--to retrieve a tape from a man who is about to release a documentary about "The Church." Failing to recover the tape, Castle was shot in the back by its creator and was dying when brought back to the Rev, who used his powers to pull the bullet out and save him. The Rev told Castle about his plan to move the Church to Guiana, and he wants him to go with them. Castle then recovered the documentary, which shows Smith shooting Homer, one of his own men whom he saw as a traitor. (Punisher II#5) - The Rev loaded up his whole "Church" congregation and sailed them to his new enclave in Smithtown, in the jungles of Guiana. He preached to his followers of the persecution in the USA, which he referred to as the Great Sodom. Telling them that the US would not allow them to just leave, he began to train them in warfare. The Rev asked Castle to train his troops, and then to kill congressman Richard Fryer when he arrives at the camp. That night the Rev sends Vickie White--the wife of Ray--to go to Castle's bedroom and help him "enjoy himself." Castle only partially showed the Rev's men how to operate the weaponry. The Rev's older sister, Sandie, then showed up and told them that Fryer would be arriving in the next day or two. That night, as the Rev spoke to his followers, Louis, a member of the Church attempted to assassinate him. Castle stopped Louis and then tried to let him go, but Byron shot him. Castle then found Byron preparing to execute a group of the followers--whom he claimed to be traitors and CIA plants--but Castle killed him. Castle headed to the Rev's house, where he found Sandie preparing some cyanide punch for his followers. Castle confronted the Rev and prepared to kill him, but Sandie threw cyanide in his eyes, allowing the Rev to alert his followers and then flee. Castle caught up with the Rev and--despite the efforts of Sandie--shot him in the gut. Castle then used the camp's speaker to announce the Rev's death and told them that he had given his life for his flock, and that his last words were for his followers to return to America and work for change there. Laying in a pool of blood, the Rev begged Castle to save him, telling him he had saved his life before. Castle responded that that was the only reason he didn't shoot him . The Church members fled into the jungle, and Castle prevented anyone else from checking out the Rev's house. (Punisher II#35 (fb) - BTS) - The Rev survived and came to the conclusion that evil was more powerful than good. He then hooked up with the demon Belasco--whom he believed was actually the arch-demon Lucifer, believing he was the source of his powers, and could increase them to even greater levels if he followed him. Belasco convinced him to destroy most of the world's population, and then recreate humanity as he wished. To this end, he hooked up with the Punisher's old foe, Jigsaw, breaking him out of Ryker's Island, and convincing him that he would heal his face in exchange for his service. The Rev learned of a Venezuelan Peña flower in the Tepuis region from which a drug could be harvested that caused sterilization. Relocating to Venezuela, the Rev used his powers to set himself up as a god in an ancient temple, and recruited a large mass of natives to retrieve the Peña flower. (Punisher II#35) - In New Jersey, the Punisher destroyed a shipment of the Rev's Peña drug. Annoyed, the Rev slashed another scar across Jigsaw's face, but then healed the new wound. The Rev then prepared his agents to return to Venezuela, while he himself headed to a suburb of West Chester. Jigsaw followed him and watched as he slew an innocent family in the name of "Lucifer." (Punisher II#36) - The Rev helped Jigsaw escaping after fleeing another shootout with the Punisher. Jigsaw told him the Punisher had learned of the sterilization scheme, and the Rev chastised him for failing to kill him. They then left by plane for Venezuela. 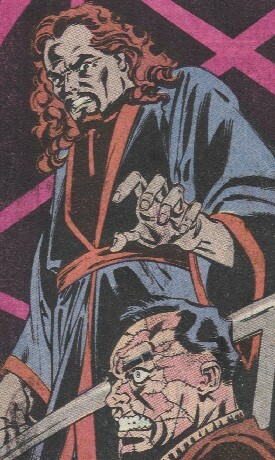 (Punisher II#37) - In the Rev's temple in Venezuela, he and Jigsaw discussed how to replace the large amount of drug lost to the Punisher. The Rev explained that the people worked for him because they worshipped him, but he then had Jigsaw kill one of the natives after learning he was stealing some of the Peña from him. (Punisher II#38 - BTS) - The Punisher arrived in Venezuela in pursuit of Jigsaw, who teamed up with local drug dealers and ambushed Castle, slicing up his face and then leaving him for dead. (Punisher II#39) - The Rev continued to prove his loyalty to "Lucifer" by ritually chopping off his own limbs, and then regrowing them. Jigsaw captured Joy Adams, a woman who had befriended Castle, to keep as a hostage, and the Rev took an interest in her, as she reminded him of her sister. Sammy proved himself to Joy by healing a scar on her face. Jigsaw eventually pulled a gun on the Rev and insisted he heal his face, which he did, removing all of his scars. Seconds later, the Punisher arrived and shot Jigsaw dead. Castle insisted that the Rev reveal this "Lucifer" to him, and he did, summoning Belasco to the temple. (Punisher II#40) - Belasco laughed off an attack by Castle, and then briefly blinded him, allowing the Rev to take his gun. Belasco then sent Castle out into the jungle to "test his worthiness" and had the Rev resurrect Jigsaw and send him after Castle and the woman. The Rev and Belasco told Jigsaw that he and Castle were being tested, with the victor becoming the Rev's right hand man, and the loser dying. However, when Jigsaw left and the Rev expressed certainty that Jigsaw would be victorious, Belasco then turned it into a wager, with the Rev losing his powers if Jigsaw failed. The Rev questioned what Belasco was actually doing for him, but the demon lord simply mocked him. Comments: Created by Mike Baron & Klaus Janson. Especially given his powers, I see no reason to think that the Rev is dead. The source of the Reverend's powers are not known. He had his powers since birth, and so he may be a mutant. 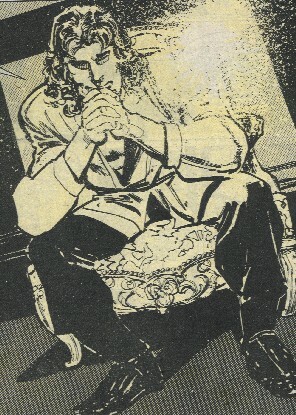 Magical means are also a possibility, but although he thought Belasco was giving him power, it appeared that Belasco was more likely playing him for a fool and manipulating him for his own ends. I ran across a trading card which described the Rev as a mutant. There are some parallels between the Reverend Sammy Smith and the real world Reverend Jim Jones, who led a cult in Jonestown, and had his followers drink Kool-Aid laced with cyanide to commit mass suicide, as detailed here. Though the years given in Punisher II#4+5 are topical, the months may or may not turn out to be so. For the record, Reverend is an adjective, just as "Honorable" is to a judge. That refers to walking through Bedford Stuyvesant, which is a rough neighborhood, which fits with him describing himself as "I may be crazy." A common misquote of the lyric is "I walked through bedroom Styrofoam," which doesn't carry quite the same meaning, but might be a crazy thing to do, nonetheless. Reserved. If you like this stuff, you should check out the real thing!